While Apple might pitch the Apple TV as the center of your streaming video universe, we know there’s no place like home when it comes to high quality content. Let’s take a look at how to access your vast home media server selection with Plex. Whether we’re talking Apple TV, Chromecast, or Roku boxes, the big thing these days is on-demand streaming content. While that’s all well and good–we love Netflix and Hulu as much as the next cord cutter–there’s still something to be said for using local media. TV shows, movies, and music stored on your local network put less demand on your internet connection, usually offer higher quality, and they work even when the internet is out. So for readers with a large collection of media they’ve ripped from disc or DVR’ed to store locally on their PC (or a dedicated media server), it just makes sense to take the perfectly-capable Apple TV and link it to their local collection. Thankfully doing so is ridiculously easy thanks to Plex. 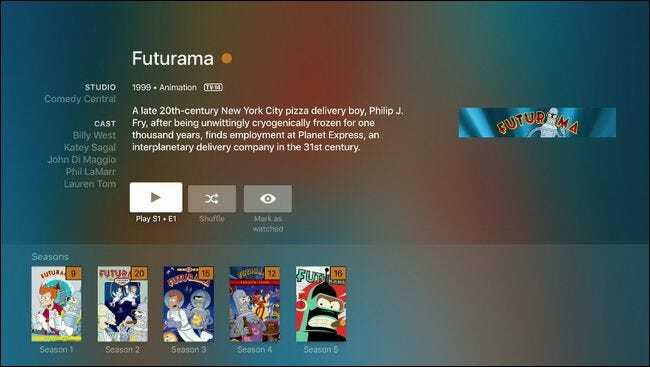 Plex is a free media organization tool and server platform that makes it dead simple to share your movies, TV shows, music, and photo collections across devices–including the Apple TV. Note: This guide is for the official Plex application for Apple’s tvOS, which limits it to the 4th generation Apple TV and above. If you have a 2nd or 3rd generation Apple TV and don’t mind jumping through more than a few hoops, you might be interested in PlexConnect (a no-jailbreak-needed way to connect your older Apple TV units to your Plex Media Server). To follow along today you’ll need a few things. 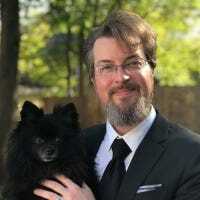 First and foremost you’ll need an Apple TV, a free copy of Plex for tvOS (we’ll download that during the setup phase), and, of course, a Plex media server to connect to. This Plex media server could be your own or it could be a friend’s who has shared their Plex media server with you. We’ve already described the process of installing and setting up Plex Media Server here, so if you haven’t done that yet, go do that now. Then come back here, where we’ll show you how to install the Plex client app on your Apple TV. 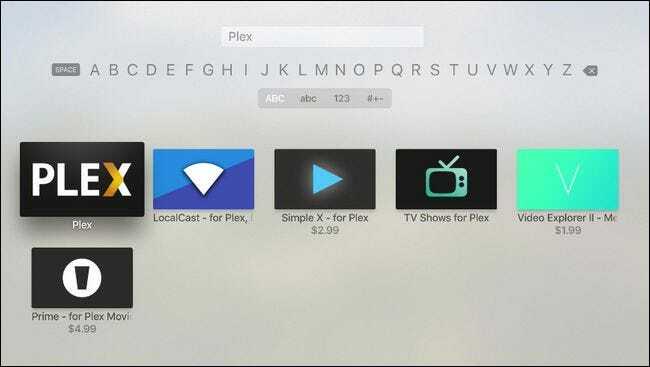 The user-friendly aspect of the entire Plex experience really shines through during the installation phase. Not only is the Apple TV Plex app polished, but the Plex team has made the process of linking the app to your Plex system completely painless. To start, fire up your Apple TV and head to the App Store by selecting in on the main screen, as seen below. Select the search option in the App Store application and search for “Plex”. Be sure to select plain old “Plex” and not any of the similar sounding applications like “Simple X – for Plex”. In the detailed view, as seen below, select the “Install” button. Once the installation is complete the “Install” button will turn to “Open”. Click it again to launch the Plex application. Take that four character alpha-numeric code and visit Plex.tv/link and enter the code to link the Apple TV Plex app to your Plex account. 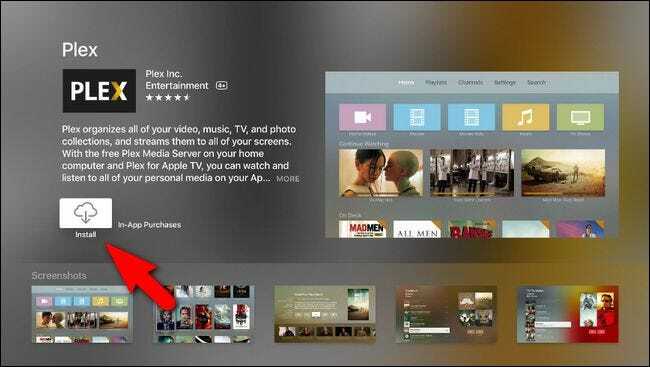 You’ll receive nearly simultaneous confirmations on both the website and the Apple TV app thanking you for using Plex. After the confirmation screen, you’ll see all the Plex media server linked to your account. 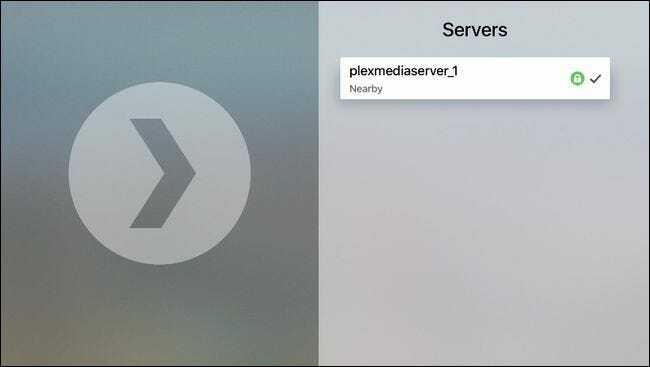 In the screenshot below you can see our one very-cleverly-named media server “plexmediaserver_1”. Select the server to access the media on it. Select the server you wish to connect to. In the screenshot below, you can see the main screen for the Apple TV Plex app. You can select from your movies, TV shows, music, and photo collections (although our test server houses only movies and TV shows, thus the limited selection). In addition, you can pull up any playlists you’ve made, as well as browse Plex channels (which are like an app-within-an-app that offer access to streaming sources like PBS, the BBC, and so on). Let’s select “TV shows” to demonstrate the playback selection and on-screen controls. Here we can pick out a show with ease thanks to the menu options like “Recently Added” as well as the local-media cover art. 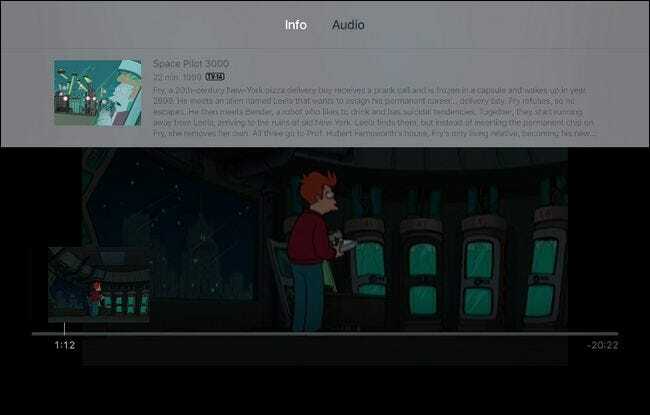 Since we’re enjoying the fruits of technology and the magic of living in the future, we’ll use Futurama as our demo show. Here you can see there’s a full overview of the show with show information, available seasons, and you can easily start at the last watched episode or shuffle the episodes into a random playlist. Once the media is loaded, you can use the Apple Remote to pause, play, adjust volume, or leap forward and backward during playback via swiping left and right on the touchpad. In addition, you can even read detailed meta-information by swiping down on the remote touch pad, as seen below. We’d describe the Apple TV Plex app controls as “just enough”. 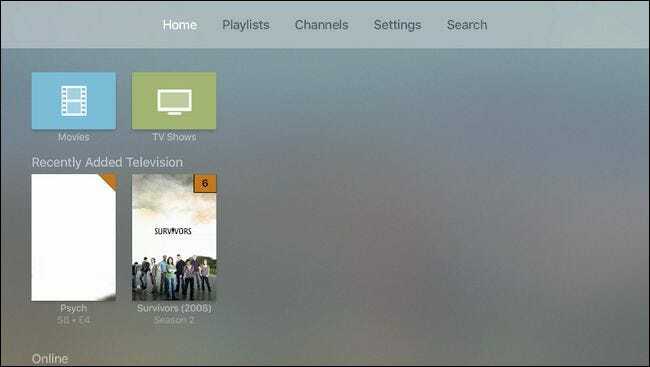 They cover practically everything you’d want to when sitting down to binge watch your favorite show, and they retain the trademark simplicity that makes Plex such a beloved media center platform. With a few very easy minutes of setup, you can go from a small library on your Apple TV to enjoying all the media your home network can serve up, all thanks to the free and easy to use Plex app for Apple TV.